Count Bites, Not Calories! : Eating slowly- a little secret with BIG results! Eating slowly- a little secret with BIG results! Eating slowly has been a big factor in helping me lose weight, and mainly just being Satisfied with my small amount of food I am eating. 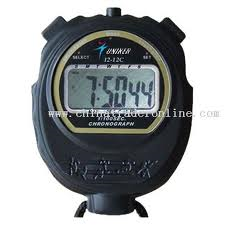 I would start the stopwatch and everytime it turned over a minute, I would take another bite. Now I wasn't perfect, but I tried to have 5 bites take me 5 minutes or 10 bites take me 10 minutes ect ect!! You get the idea! I have found One Minute to be the ideal time between putting one bite to another in my mouth. You can set it anything you want, if its slower than you have been eating, that's progress! Another thing I have noticed is that it has taken me sometimes as long or longer as my family or nearly so to eat my measly little bites. This alone helps one to feel more satisfied. This especially helps those who have a problem with binge eating! If you tell yourself you have to eat each bite only once per minute, after while it doesn't become so fun to binge anymore. It actually becomes easy to STOP binging, a it becomes boring to sit there and eat! Eating Slowly has been proven to help people lose weight! 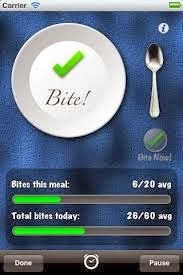 I recommend combining eating slower with bite counting, but even if you only start by eating each of your bites with a minute between, I can almost guarantee you that you will lose weight. You might say, no way, I would just keep on eating, but eating slower makes it way easier to stop eating. When people binge or overeat, they tend to SHOVEL food into their mouth. Eating slowly helps you savor your food. I don't nessesarily chew a long time or anything, but just pausing between bites makes a difference in how you enjoy what you are actually eating! Recent research presented at a meeting of the North American Association for the Study of Obesity showed that overweight men and women took in fewer calories when they slowed their normal eating pace. And a recent Japanese study involving 1,700 young women concluded that eating more slowly resulted in feeling full sooner, and thus eating fewer calories at mealtime. Stretch receptors in the stomach are activated as it fills with food or water; these signal the brain directly through the vagus nerve that connects gut and brainstem. Hormonal signals are released as partially digested food enters the small intestine. One example is cholecystokinin (CCK), released by the intestines in response to food consumed during a meal. Another hormone, leptin, produced by fat cells, is an adiposity signal that communicates with the brain about long-range needs and satiety, based on the body’s energy stores. Research suggests that leptin amplifies the CCK signals, to enhance the feeling of fullness. Other research suggests that leptin also interacts with the neurotransmitter dopamine in the brain to produce a feeling of pleasure after eating. The theory is that, by eating too quickly, people may not give this intricate hormonal cross-talk system enough time to work. People who eat slowly tend to consume fewer calories and weigh less than those who eat quickly, research shows. Slower eaters also report enjoying their food more and having greater satiety. So try eating slower and see if you are not more satisfied and lose more weight! If you try eating slower, share your results in the comments below! Can you help me figure out how to set my eatslowpro to buzz rather than make a sound? Vibrate is not one of the options under settings??? I love the app, but would love it even more if I could use it in public. I am using it on an iphone. Thanks again for all your hard work writing this blog and linking to other bite diet sources. I am really enjoying it. Go to the bottom of your screen on the main page with a picture of a plate. You will see a clock icon at the bottom in the middle. Click on the little clock icon. 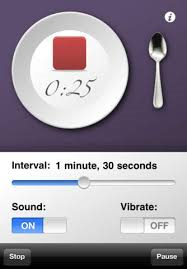 This pulls up a menu where you can turn sound on and off and you can also turn vibrate on and off easily. :) it's not in the settings menu. "Hunger is never an emergency"